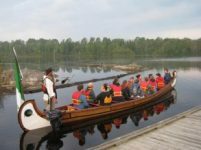 There are several wonderful local businesses that offer a variety of outdoor experiences from guided hikes to canoe trips in the old-Voyageur style including French songs and those funny hats! Not only does H.W.E. offer some of the world’s top river adventure expeditions, it also offers instructional programs in both flat and moving water canoeing and sea-kayaking. There are also serious rafting runs for those adrenalin junkies. In winter, we offer cross-country ski packages, snowshoeing, ice fishing and environmental presentations. Your guides, Rick and wife, Jocelyne, bring a wealth of knowledge to the table about the outdoors, wildlife, and the importance of our natural resources. Your experience with H.W.E. will be a lifetime opportunity to experience a unique remote river expedition. Your job is to show up. Then Howling Wolf Expeditions will take it from there.